Blog on Core Java and JEE for Java enthusiasts. In this post,we will learn how to setup maven on Mac machine. Download maven at any convenient location on your system from following link.It comes in compact form in tar.gz format. Press 'I' key,which will bring .bash_profile in edit mode. Set PATH environment variable as below by adding following line in .bash_profile file,so that you can execute maven commands from any directory. 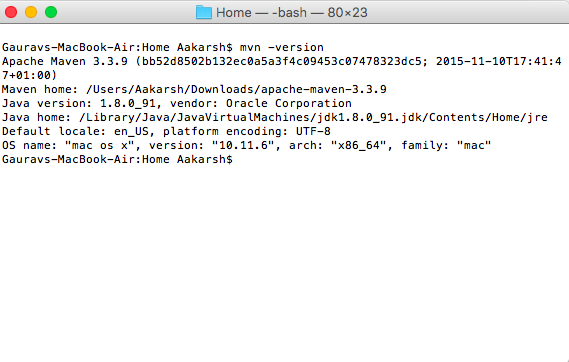 Set environment variable JAVA_HOME as location of JDK on your system.If you don't have JDK installed ,you should install that first. Step 9: To know if maven is installed successfully,execute following command and you will be able to see installed version. Thats it.So with this we learnt that how to set up maven on mac machine. Thanks for reading.Let me know if you face any issue in setting up in comments section. Dear Friends, In this post,we will discuss about java.util.HashMap.How does HashMap works internally in Java. This blog is written and maintained by Gaurav Bhardwaj.He has more than 10 years of experience in Java development and his aim is to provide easy to understand tutorials on Java/JEE.